Most of the collages in this gallery are available for purchase in the $300 - $500 range. They are also available in print in either of two sizes, 8"x10" print, matted to fit in an 11" x 14" frame for $35, or 13" x 19" print matted to fit in an 18"x 24" frame for $45. 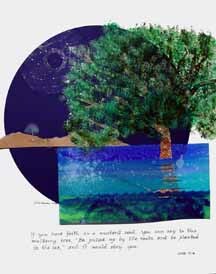 Scroll down to see larger versions and descriptions of these collages. 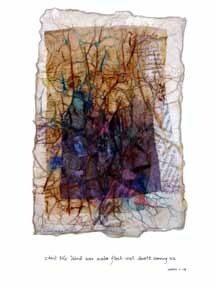 The collage measures 16"x20" and incorporates stamping, tissue paper, inks, and other media. Also available in print and card form. "Thou shalt love the Lord thy God with all thy heart, and with all thy soul, and with all thy mind, and with all thy strength. . . . Thou shalt love thy neighbor as thyself." This 16"x20 collage uses various papers, paint, bleach, batting and stitching. The colored papers are slightly stuffed, but the collage is still mostly two dimensional. 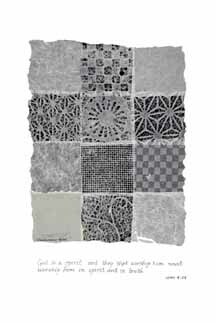 This 16"x20" monochromatic collage uses a grid to form a cross with various rice papers over black. Available in print and card form. "I am the Alpha and the Omega, the Beginning and the End, who is and who was and who is to come, the Almighty." This 16"x20" collage includes cut paper and Prismacolors. 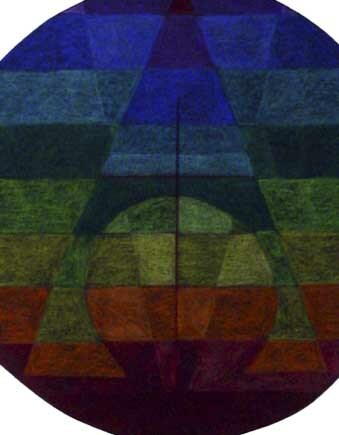 The placement of the bands of color forms the Greek Alpha and Omega. "If you have faith as a mustard seed, you can say to this mulberry tree, 'Be pulled up by the roots and be planted in the sea,' and it would obey." This 16"x20" cut paper collage includes rice paper, Sheer Heaven paper, acrylic paint, watercolor, alcohol, Prismacolors, and a mustard seed, barely visible below. 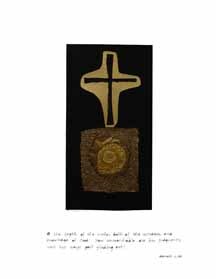 This 16"x20" torn and cut-paper collage uses seven different gold papers, layered to suggest the riches of God in wisdom and knowledge. 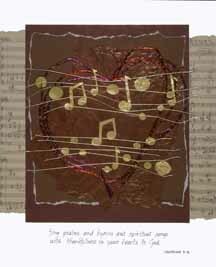 "Sing psalms and hymns and spiritual songs with thankfulness in your hearts to God." 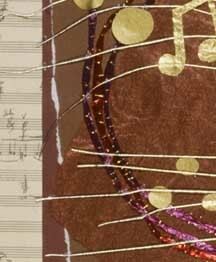 This 16"x20" torn and cut-paper collage uses various papers (including manuscript from a contemporary composer, Donald Grantham), and a variety of fibers couched with gold threads. "We see through a glass, darkly; but then face to face: now I know in part; but then shall I know even as also I am known." 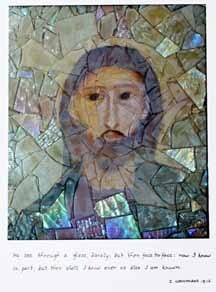 This 16"x20" mixed media piece incorporates an original acrylic portrait of Jesus, covered with a mosaic of different kinds of glass. 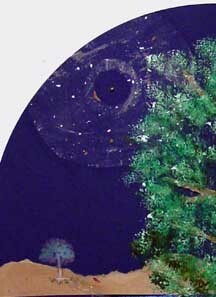 It is in a dark wood shadowbox frame. It is very difficult to photograph well because of the different depths and textures of the glass pieces. "For of his fullness we have all received grace upon grace." 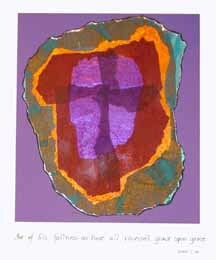 This 16"x20" collage incorporates tissue papers on foil randomly overlapped, except where the purples are intentionally overlapped to form a cross. Available in print and card form only. 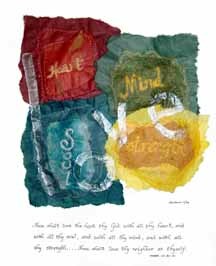 This 16"x20" collage uses the same text and paper types as the Grace Upon Grace collage above. The color schemes are very different. Notice the cross in the colored papers that is formed by folding the paper. Available in print and card form only .